Exhibition is consists of installation in two separate rooms. 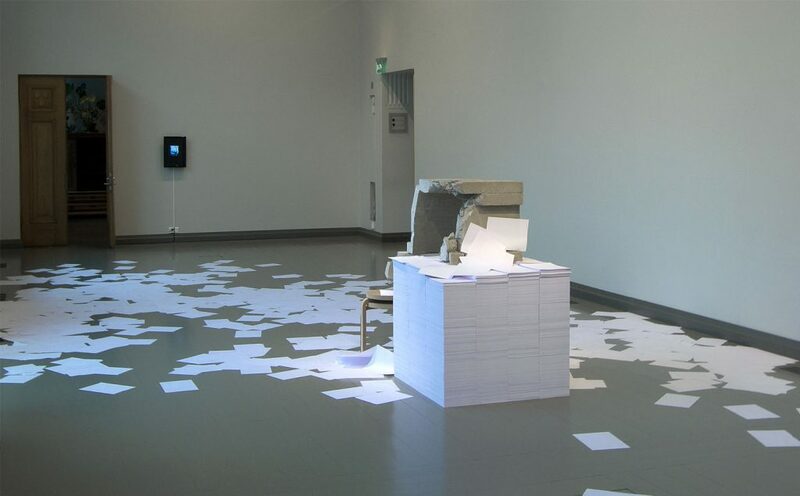 In the middle of room is a cube which is made of white A4 copypaper. Behind the cube is a pile of fake Alvar Aalto stools (stool 60). Stools are made of MDF-board. Two architectonic concrete fragments lie partly on stools and partly on papercube. Bigger fragment is placed so that it stays in equilibre between pile of stools and papercube. On the end of room close to celing level is a wind machine. Machine is programmed so that it ocassionally blows a strong gust to the room. Air current removes papers and gradually dismantles the cube. On the other end of the room is a 20 ” flat videomonitor which shows short video of jackdaw escaping from his nest. Video is shooted through a safety net in towers of San Giminiano. This room is a permanent exhibition of Finnish animal sculptor Jussi Mäntynen (1886-1978). In this room there is a black and white illusionistic sculpture. Sculpture shows a fictional situation of a sculpture by Jussi Mäntynen in progressIn the sculpture part of lynx's head is visible from a artificial block of stone. 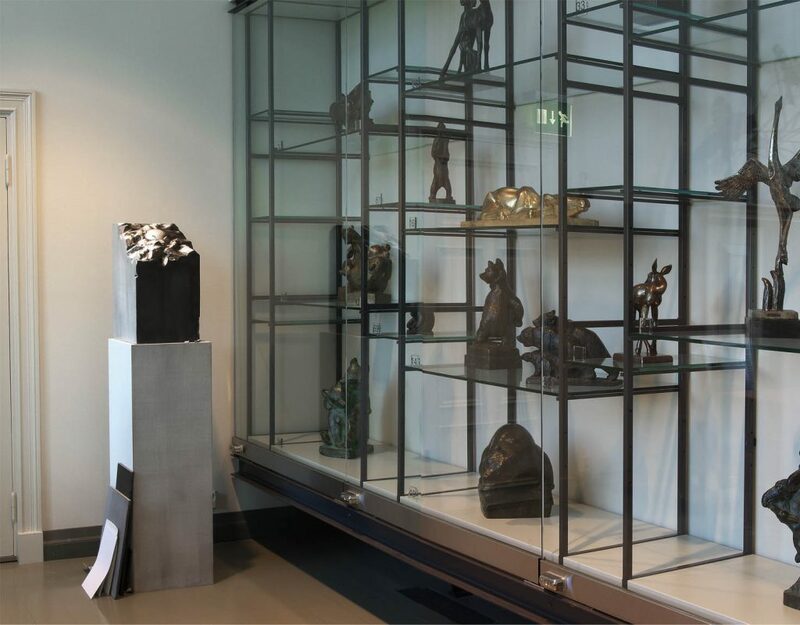 Original Lynx statue made of granite is exhibited in the same room. Block is placed on a plinth with some boards and trash leaning to it. Sculpture is made of styrofoam coverd with Foamcoat, MDF-board and aluminium. 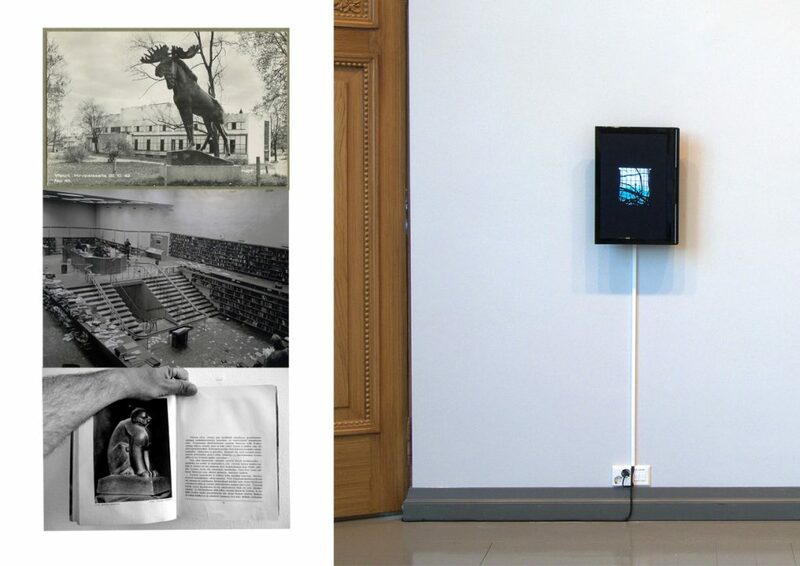 Installation Bird and Library is quite diverese in relation to your earlier works. It has different elements, materials and medias in one constitution. What lies behind this way constructing a work? In my latest works I have dealt a lot with idea of narrative, fictive installation. Simply said the idea is to create an environment of various visual and readible elements which in interaction to each other and viewer create sort of narrative network. Different medium require their own form of language and vocabulary which doesn't create a language of their own but a mixture of starts and meanings within the space. Using different mediums prevents the meaning to crystallise to fixed point. It requires the viewer to change viewpoints and thus "start again" looking at the work. This also reason why I like using elements which have temporal nature. Tell me about how you start your work. For example with this exhibition. I work very differentily with different medias. In installation works the startingpoint is always in exhibition space. I begin with research of history and characteristics of space in use. This work has a lot to do with Turku Art Museums collection, especially the Jussi Mäntynen collection in next room to the Studio space. Mäntynen was a former taxidermist who later devoted himself to animal sculptures. He was popular in Finland in 19 th century. Sculptures are stylized and have also a strange almost cartoon-like exaggereting outfit. His works have strong nationalistic emphasis. His active years were the years of forming the Finland as independent state. One is his most famous sculptures is a Elk statue. Copys of that are located in four various citys: Viipuri (Russia), Helsinki, Lahti and Turku, where this exhibition took place. While doing the research for this exhibition I found an old poscard which depicted The Elk Statue in front of Alvar Aaltos famous Viipuri library in Russia, on former finnish area. The photo was taken in 1942, during the truce between two wars between Finland and Sovjet Union. Role of Alvar Aalto as "nations architect" was obvious. His international poetic modernism was regarded as a finnish genuine style. The contradiction and common background between Mäntynens heroic, mythologal sculpture and Aaltos timeless formalistic funktionalism was fruitful and contradictory combination. Both are regarded as constructors of national esteem even they represent opposite ends in style of their production. The exhibition took place Turku, city where Aalto had his office in beginning of century. The first functionalistic building in Skandinavia, Turun Sanomat printing house, is located in same town. Aaltos set of Standard furniture for Viipuri Library was made in Korhonen factory in Turku. Viipuri Library was the first public building by Aalto where he used for exmple the famous three leg stools (Stool 60). Aaltos architecture opened to me the idea of standardisation. Aalto himself didn't have clear systems, but Le corbusiers and Aulis Blumsteds systems are well known. I ended up using A4 paper which is maybe the most common standardised "object" we meet every day. It has tactility that is familiar to everyone. It represent also something which is bound to idea and potentiality. It gets its content by abstraction, text or drawing. A4 is sort of white cube in two dimensions. By constructing a plinth from this paper I created nothing from nothing, a platform for content. That white cube had also role as a supporter of concrete fragment. The pile of fake stool 60s had similar nature. They were used as supporters instead of a seats. The material MDF-board is basicly paper, it has a clear sense of being a non-material, material of idea. Concrete fragment has parts copied form from Viipuri Library, for example well known outline of bird from reading rooms ceiling. That is something Aaltio designed as an acoustic and visual element. In the other end there is a wind machine. Is it just to make papers move? When I started to do this exhibition I felt like using elements of spectacle. In the houses Aalto designed I have visited have certain modesty in them, they are intimate even when they are public buildings. I wanted to include something opposite to this work. The wind machine is a machine for special effects, to create artificial naturalistic effect. It has exaggerative like in Mantynens sculptures. 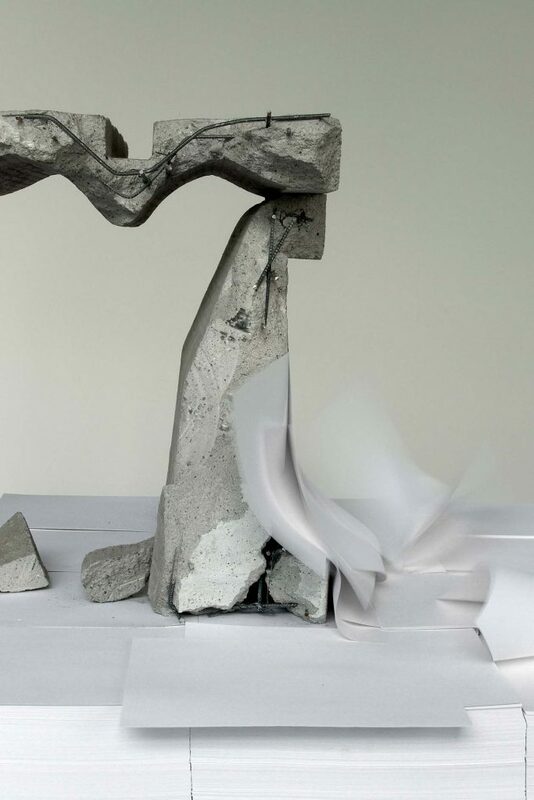 Gusts dismante the paper cube and change the exhibition situation to a temoporal performance. The sculptural elements act by chance. Wind machine also takes viewer to be a part of exhibition, artificial wind disturbs them and creates a white paper floor. The Jackdaw video is a decoy to viewer to move over the paper-covered floor. The video itself is very simple, just one image, a glipse of bird, Jackdaw escaping from its nest. Most of the time picture is empty with only black grid and branches moving in wind. Video is shooted on on handheld camera. Safety net constructs a grid over the picture. It organizes the image to smaller units. Everything that happens, happens behind it. I see that as a reference to the A4 paper in the cube. Because you can see only a glimpse of the bird, viewer is obliged to wait in front of monitor for something to happen. While looking at video he is located between a wind macine and a picture of windy situation, back turned to sensation while looking at abstraction. In the room behind the Studio space is a Jussi Mantynen collection, a small room filled with animal sculptures. In your sculpture there is a cube on a plinth, cube is broken from the top, some round forming on the top of the cube. On the floor, leaning to plinth there are boards, papers and thrash. All this is painted black and white so that it resembles drawing or black and white photo. How does this work relate to Mantynen or this room? I found an old book from 1929 where his work was presented. In the book there were profound descriptions of his devoted working methods. As a former taxidermist he knew anatomy but he also spent long times following animals in nature, discussed with hunters and followed animals in zoo. The text created almost a fictional character of artist devoting himself to his work. Interesting was the way how written text by descriptios drew the sculptures to diffrent level. Stone sculpture of Lynx was transformed to a transcendental creature. I wanted to create very representative, pictorial work here. Main room of exhibition was filled with materials as they are. I wanted this back room to be a contradiction other parts of the exhibition and also to Mantynens stone and bronze works. I made a fictional sculpture of unfinshed lynx statue. It is a picture of work in progress. Everything in sculpture is fictional: It represents situation which has not happened, it depicts materials with materials of illusion, it is painted so that it looks like flat picture. It is opposite to Mantynens works and materials, but is by its form transsendential as original Lynx statue is by text. Combination of these two rooms has a wide range of refrences from concrete historical happenings to material meanings. Why do you want to fill the work whit such a load of meanings?